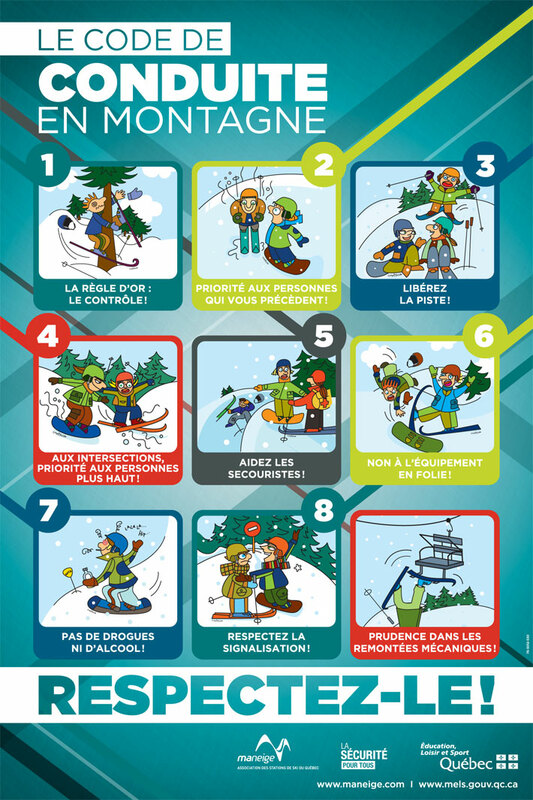 Thanks to our ski patrol’s prevention measures on the hill, the number of accidents on the slopes of Tremblant is well below the provincial average. Nevertheless, many skiers violate the basic rules, and, by doing so, put themselves in bad situations or put other skiers in danger. No matter your skill level, you must be able to stop and avoid obstacles at all times, including other skiers. Although the Mountain Code of Conduct stipulates that skiers must be in control at all times, it is very important that you follow the flow according to the trail level. Speed will not be tolerated the same in an expert area and in a beginner area. We encourage you to use your judgement and adapt your speed according to the area you are skiing in. When you ski faster than most skiers around you on the slope, it means you are skiing too fast. Be courteous and respect the surrounding flow. Up and above controlling your speed on the mountain and in all controlled areas (learning zones and slow zones) at all times, you must also respect all types of signage. Signs, bamboos and ropes warn and direct skiers and are strategically positioned by our ski patrollers to warn skiers of hazards on the trails. You must respect them! Visit our Mountain Code of Conduct website page to learn more about safety on the mountain. Tremblant International Blues Festival honoured!